You can’t go wrong with either of these battery chainsaws. Both are excellent. Looking for the best GreenWorks chainsaw? We’ll save you time by telling you everything you need to know. We’ve already done the research for you. In this article I’m going to focus on the GreenWorks 20312 40V battery chainsaw and the relatively new GreenWorks 80V chainsaw. Both are excellent cordless chainsaws that deserve your consideration — if you care about buying a well-built, reliable and powerful battery chainsaw. We also cover other GreenWorks chainsaw models but our focus will be on our top two picks for the: Best GreenWorks Chainsaw. Before I get into all the details I want you to watch this video on the GreenWorks 80V chainsaw. This way, you’ll understand why I’m so excited about this particular chainsaw. GreenWorks is a relatively new brand in North America but they have proven themselves to make fantastic power tools for homeowners. The customer satisfaction for GreenWorks tool owners is quite high. The company has done a great job of providing value to consumers by packing a lot of innovative features into their tools while keeping them affordable and inexpensive. What more do you want. GreenWorks has a fantastic reputation for reliability — this saw is a winner. I will say that it’s difficult to find the history of GreenWorks but I’ll tell you what I’ve discovered. First of all, GreenWorks is a brand owned by Changzhou Globe Tools Co., which is a Chinese company. They actually manufacture tools for a variety of top North American brands, which is not as strange as you might think. Globe Tools is a privately-held company in Changzhou, China. They’ve been Operating globally since 2001. They currently have 3 of their own brands: GreenWorks, PowerWorks and ToolWorks. WORX is another Chinese company that makes great yard tools. They are responsible for the incredibly popular WG303.1 chainsaw, which we’ve covered in the past. I know some people think that Chinese products are inferior but that’s simply not the case. A GreenWorks chainsaw can compete with any other chainsaw brand on the market — and their 80V chainsaw is the most powerful battery chainsaw on the market right now. Bottom line: GreenWorks makes dependable lawn and garden tools and if you don’t believe me, just ask their customers. This article will focus on the best GreenWorks battery chainsaws. Well, at least in my own humble opinion. These two chainsaws are outstanding and offer excellent value — assuming you appreciate battery chainsaws as much as I do. The ideal chainsaw for demanding cutting jobs. 80V of raw power. Best for: Cutting wood up 16″ in diameter and the occasional large tree up to 30″ in diameter. Excellent for pruning, limbing, felling trees, clearing brush, firewood cutting — basically anything around the home. Excellent power for clearing storm debris and fallen trees. Cons: Expensive. Heavier than most battery chainsaws at 13.7 lbs. The GreenWorks 80V chainsaw will change your mind about what a battery chainsaw can do. It’s the equivalent power of a 45cc gas chainsaw and when you hold it in your hands it has the same sturdy and solid feel of a gas chainsaw. Designed for people who value quality in their tools. Clearly, the brushless motors is a major innovation that contributes to 30% more torque, less noise and 70% less vibration. Also, brushless motors draw less power and therefore maximize battery life. These are significant advantages that you shouldn’t overlook. The brushless motor has a very generous 10 year warranty. Proof that the brushless motor is superior to other battery chainsaws. The chainsaw itself has a 4 year warranty, which is also a strong indication that GreenWorks stands behind it’s tools. This GreenWorks chainsaw has an 18″ bar and chain, large metal bucking spikes and an automatic chain oiling system. Ergonomics is apparent from the moment you pick up this chainsaw and grasp the metal wraparound handle. At 13.7 lbs this 80V chainsaw isn’t light but it’s not heavy either. In fact, it’s well-balanced and the extra weight gives you the confidence that this tool can handle heavy-duty cutting. It doesn’t feel or look like any other battery-powered chainsaws, with tend to feel more like toys. Beautifully designed. GreenWorks put a lot of thought into the overall styling. Capable of cutting wood up to 16″ and the occasional large tree, up to around 30-inches. The reality is that it’s still a battery chainsaw so the ‘sweet’ spot for cutting diameter is under 16-inches. Yes, as I said, it can handle more but it will start to noticeably slow down with larger trees. If you need a chainsaw for heavy-duty cutting then try a Husqvarna 455 Rancher. It has a convenient flat bottom surface which allows you easily and quickly set it down anywhere without having to worry about it falling over. The GreenWorks 80V chainsaw has an electronic chain brake to protect you in case of kickback. Unfortunately, to adjust the chain tension you’ll have to use the supplied wrench. It’s not a big deal but it would have been nice if the chainsaw had a tool-less tensioner like the GreenWorks 40V chainsaw. How to adjust chain: Loosen the chain cover lock nuts with the supplied wrench. The chain cover lock nuts do not have to be completely removed in order to adjust the chain tension. Currently, there are two batteries available and they charge super fast — under 30 minutes for the 2.0 Ah battery and under one hour for the 4.0 Ah battery. These are hefty batteries and the fact that they charge so quickly is extremely impressive. I wish more battery powered chainsaws had a fast charger available because one of the biggest drawbacks of a battery chainsaw is the actual battery; because they’re typically slow to recharge — but not with the GreenWorks 80V system. There will be more batteries coming out for this chainsaw but as of this writing they have not been released yet. GreenWorks has promised to release more powerful soon: A 360Wh 5.0 Ah battery that will charge in 70 minutes and a 460Wh 6.4 Ah battery will charge in under 90 minutes. Lastly, in the Fall, they will release a Battery Backpack that charges in 3 hours. Ergonomic with a metal wraparound handle. 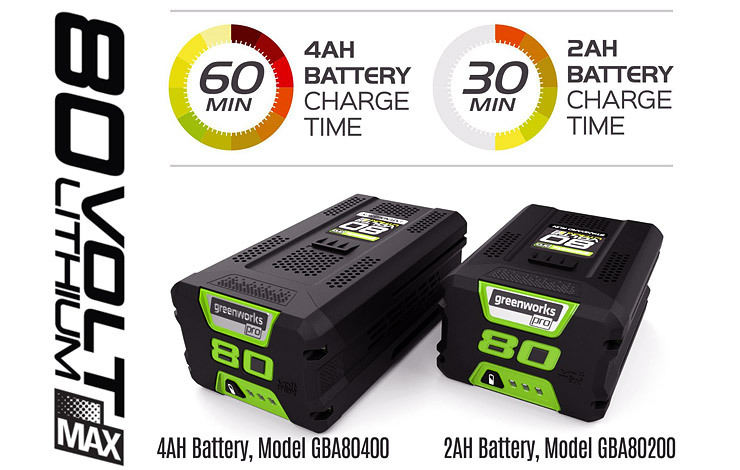 Make no mistake, these are powerful batteries with a lot of juice but as you’ll notice, they are expensive — in fact, the 2 Ah battery equals the price of the 80V GreenWorks chainsaw. This isn’t a chainsaw for the average homeowner, this is for someone who needs lots of power, convenience and can afford to spend the money. People who can appreciate exceptional tools should, and will buy this product. It truly is revolutionary. For a large majority of homeowners, the GreenWorks 20312 40V chainsaw, which is included in this article, will be a better choice because it’s much cheaper and still provides you with the freedom and convenience of a battery chainsaw. But it’s not designed for any heavy-duty cutting and the battery won’t last as long. These are high performance 80V Lithium-Ion Battery that deliver fade-free power with no memory loss from charging. They’re designed with an on-board battery “fuel” indicator which tells you how much power remains in your battery. Very useful indeed. One battery, six tools. A versatile system for homeowners. You should know that the 80V GreenWorks system requires that you purchase all the components separately — chainsaw + battery + rapid charger. Because the 80V GreenWorks system is compatible with a variety of tools GreenWorks decided its best to let the consumer decide what to buy, which makes perfect sense. Now, another thing about this 80V battery system is that it’s compatible with a full range of GreenWorks yard tools so in theory you can buy several GreenWorks power tools and have only one battery to share between them. That’s the beauty of this system. If you plan on purchasing more than one 80V tool then it’s far more cost effective to do so. Imagine having a full range of 80V GreenWorks tools in your tool shed. Your neighbors will be envious. The GreenWorks GCH8040 Rapid Charger is the last component that you’ll need to complete your system. It can charge the 2.0 Ah battery in under 30 minutes and the 4.0 Ah battery in under one hour. Your downtime will be minimal. If you owned two batteries you’d never have any downtime. Think about that. You could work all day. One battery charges as you work, and the cycle continues. If you have a healthy bank account and have a need to do a lot of cutting around the yard or for your landscaping business then this is the tool you want to put your money towards. You’ll be impressed at how much power it delivers and the battery life is excellent. Time to Charge : From just 13 minutes 50% charge. See individual batteries. LED Lights : 1 LED light (two colors) indicates charging status. Wall Mounting : Charger can be vertically wall mounted. Is the GreenWorks 80V Chainsaw Right For You? Lots of power. Sturdy build. Easy to use. An excellent chainsaw. The 80V GreenWorks Chainsaw has several benefits over other chainsaws. For starters it’s currently the most powerful battery chainsaw on the market; delivering the highest amount of torque with the least amount of noise and vibration. It’s exceptionally well designed. Just look at it. It’s a solid chainsaw with heft. It feels good in your hands due to the excellent use of materials, ergonomic design, and metal wraparound handle. Honestly, this GreenWorks chainsaw gives you everything you want in a chainsaw — the power equivalent of a 45cc gas chainsaw and the convenience of a battery chainsaw. What more do you want? My only real complaint is that it’s expensive once you add up the cost of the chainsaw, battery and charger — but if you can afford it, it’s definitely worth it. You get a lot of value with this 80V chainsaw, and there will be nothing that you can’t handle around the yard. Now, if you want to cut all day long then you either need to buy two 4 Ah batteries or buy a gas chainsaw. We’ve written a lot of reviews here at Chainsaw Journal. We’ve compiled a ton of research and looked at the data. We’ve combed over countless customer opinions and reviews and after all of that, I must confess that the GreenWorks 80V chainsaw is the top contender for the best chainsaw — assuming you can afford it without breaking the piggy bank in your closet. Built with high-quality components. The Lexus of battery chainsaws. It’s not the cheapest. In fact, it’s one of the most expensive, but it straddles a fine line between power, versatility, convenience, longevity, design, safety, quality and performance. Add it all up and it truly deserves to be considered one of the best chainsaws currently on the market. I think this my favorite new chainsaw. Truly. But, I understand that most people are on a budget and can’t afford the premium 80V GreenWorks chainsaw — and so, for those of you who want a quality battery chainsaw you’ll be very happy with our next chainsaw review — the GreenWorks 40V 20312. It costs under $200, which is reasonable for the power and features you get with it. Features of the 80V GreenWorks. View or download the MANUAL for the GreenWorks GCS80450 80V Chainsaw. Read the original press release for the GreenWorks 80V line of tools. 80V Li-Ion System. Most powerful gas-free cordless chainsaw. DigiPro digital controlled brushless motor: 30% more torque and 70% less vibration. Equivalent power to 45cc gas engine. Large steel bucking spikes and ergonomic metal wrap handle. Electronic chain brake for increased user safety. One battery system works with a variety of yard tools. Less maintenance, light weight and easy electric start. No winterization to worry about. Your neighbors will be jealous — and they’ll appreciate the low noise. A very well-balanced chainsaw with excellent accessories. Ideal for homeowners. Best for: Cutting wood up 10″ in diameter and the occasional large tree up to 26″ in diameter. Excellent for pruning, limbing, felling trees, clearing brush, firewood cutting. Great to have for clearing storm debris and fallen trees. I’ve covered the GreenWorks 40V 20312 in several articles on Chainsaw Journal, and for good reason: It’s an excellent battery chainsaw that packs a lot of punch in a small package. Powered by an efficient and powerful 40V G-MAX battery. This GreenWorks chainsaw is well-suited for light to medium-duty cutting around the house. If you don’t like gas chainsaws because of the high maintenance, noise, vibration and gas fumes then this is a great choice for the average homeowner. If you don’t need the power of the 80V GreenWorks chainsaw then this is a great tool for you. It comes with a 16″ OREGON bar and chain, metal bucking spikes for improved stability when cutting and the always useful tool-less chain tensioner which allows you quickly tighten your chain. It also has a brushless motor which means that it’s far more efficient than standard electric motors, producing less vibration and noise as a result. Noise is a major drawback of gas chainsaws which I think far too many people underestimate. GreenWorks claims that you can cut a full cord of wood on one battery charge but I think that’s a little ambitious. You might get close to that type of performance but in the real world, as you know, there are too many variables to expect that type of production. On the other hand, the 80V GreenWorks chainsaw can cut a full cord of wood as it gets 15o cuts on one battery charge. The 40V only gets 100 cuts per charge. The charger can charge the G-MAX 2 Ah battery in 60 minutes and the G-MAX 4 Ah battery in 120 minutes. This is slower than the 80V system but I guess that’s too be expected since this is older technology. GreenWorks knows how to make consumer-grade power tools. The brushless motor has a 10 year warranty — Proof that the brushless motor is superior to other leading brands. The chainsaw itself has a 4 year warranty, which is generous but GreenWorks has proven itself to be an excellent manufacturer. All of their products are unanimously well-regarded by the people who matter most — their customers. The G-MAX 40V Li-Ion battery is compatible with a full range of GreenWorks tools so you can simply share one battery among your tools if you decide to purchase more than one GreenWorks 40V tool. In the long run, it makes sense to build up a set of tools that share the same battery system. It’s far more convenient and cheaper if you calculate it out over time. It’s a great 40V system and all of these tools are excellent. Not one bad tool in the group; which goes back to my earlier point that GreenWorks makes excellent yard tools for homeowners. If you value convenience then you’ll love the GreenWorks 20312 chainsaw. It’s lightweight at only 10.36 pounds. It starts instantly and requires very little maintenance: keep the chain sharp and top up the bar and chain oil. Stop the motor and remove the battery from the chainsaw before adjusting the chain tension. Slightly loosen the chain cover lock bolt. Turn the chain tensioning bolt clockwise to tension the chain. How do you know when a cold chain is tensioned correctly? The chains is correct when there is no slack on the underside of the guide bar, and it can be turned by hand without binding. You get a lot of chainsaw for not a lot of money. The customer wins with GreenWorks. You get a lot of value with the 20312 GreenWorks Chainsaw. The entire package includes: G-MAX 40V Chainsaw, 16″ Bar and Chain, G-MAX 40V 4Ah Lithium-ion Battery, Charger, Carrying Bag, Owner’s Manual. And the price is very affordable and reasonable. If you don’t already know, lithium-ion battery tools are expensive. The actual batteries are the reason why, not to mention the need for a charger. You won’t find a better value than either the 80V GreenWorks chainsaw or this 40V 20312 chainsaw. It’s a well-balanced battery chainsaw that that can handle all of your pruning and limbing needs around the home. It can also fell small trees and cut firewood, but it obviously can’t handle the same load as the 80V GreenWorks Chainsaw. The sweet spot for cutting with the 40V chainsaw is when you’re cutting wood that’s under 10″ in diameter. Yes, it can cut a 30″ log but it will be extremely slow and drain your battery quickly. If you need to cut 30″ trees on a regular basis then you need something more powerful, like the Husqvarna 455 Rancher. A chainsaw that anyone can use. Overall, the 40V 20312 is a great performing GreenWorks chainsaw designed with excellent features and built to high standards. It’s easy to use and feels sturdy in your hands. Honestly, the only negative is that the battery could last longer and the charging time could be quicker — it’s slower than the 80V system and it might give out before you do. Not to sound like a broken record, but a second battery is a good idea if you don’t want any downtime and you can afford it. Don’t spend beyond your means but consider your options and balance that with your needs. You might need a backup battery, depending on your needs. NOTE : Chainsaw don’t typically ship with bar and chain oil so you have to remember to buy it separately. With this 40V GreenWorks chainsaw, the manufacturer recommends that you check the level after every 20 minutes of use and refill as needed. Thankfully, there’s a translucent window so it’s easy to see when your oil level is low. 1 Quart. Oregon 54-026 Bar & Chain Oil. What’s in the Box? G-MAX 40V Chainsaw, 16″ Bar and Chain, G-MAX 40V 4Ah Lithium-ion Battery, Charger, Carrying Bag, Owner’s Manual. View or download the MANUAL for the GreenWorks 20312 40V Chainsaw. Up to 100 cuts on a single charge. 40V battery is compatible with a wide range of GreenWorks power tools. 16″ Oregon Bar and Chain. Cuts logs up to 30″ in diameter. Brushless motor = 30% more torque. Brushless motor engineered to reduce chainsaw vibration by 70% or less. Chain brake and low kickback chain for your own protection. Only compatible with GreenWorks G-MAX 40V Battery. Models: 29462, 29472 and Charger 29482.